Before the design and implementation of The CW’s first application, its web business was booming. The network had a devoted fan base and wanted to expand its vibrant web community by leveraging mobile devices to deliver content. The CW’s audience of young, tech-savvy viewers wants their shows to be accessible on multiple devices on demand, regardless of physical location or technology platform. In the words of Jon Mantell, Vice President of Digital Products and Video for CBS Interactive, “The interest of The CW’s users was very clear. It is our imperative to elevate the mobile experience—to give those fans the experience they demand.”Mobile accessibility wasn’t just important to CW viewers; it was critical for maintaining the network’s youthful brand. 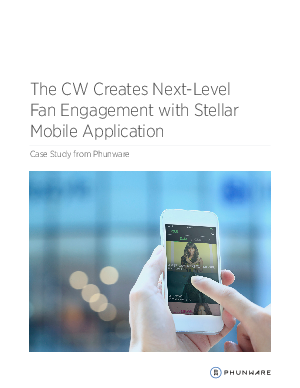 The CW had to find an application developer capable of achieving its vision, giving fans the functionality they wanted, and becoming a partner it could trust to help maintain and deepen the CW brand.